Apocalyptic Death. 'Cause Collapse 7 are very dark, menacing, with thunderous blasting drums and strings played with care. 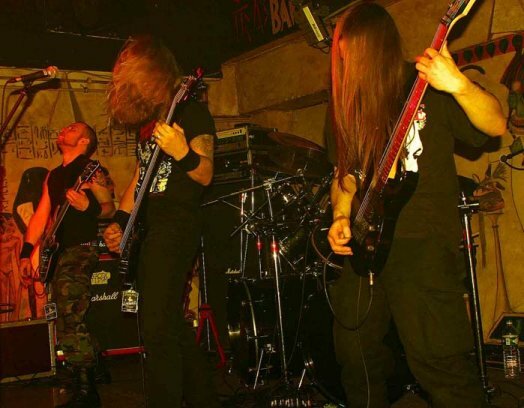 Doom and Black attitude are included in their music full of heaviness with calibrated brutality and calibrated attacks. 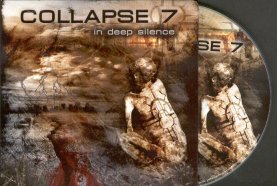 Collapse 7 are more "bone-breakers" with impending melodies than torture killers, they evoke a sense of abyss and gravity. A Melodic Death with a certain hybridization from Classic Death to Black for all who appreciate extreme styles with a certain solemn immediacy without many complications but with melodic contents, much rhythm and intensity. Collapse 7 are pure menace. I don't know if the name of the band has something to do with the collapse of the building 7 of the WTC complex. Disputable thing cause, a worrying question still is open: did the building 7 collapse as a consequence of the well known disaster of the two towers of the same complex, or did it collapse through a controlled and induced order? Whatever the inspiration of the name can be , maybe only related to the musical characteristics of their Death, Collapse 7 are a "new" entity in the world of Death. Simply cause they are able to combine the melodic attitude of Kataklysm, and a bit of their Shadows and Dust drumming, together with Swedish Classical and much of Doom-like menacing attitude, with a good contribution of Black tendencies. Growlings that are mighty, linear and solemn, "granitic", act like a ever-lasting menhir among an energetic, pushing , blasting music with melodious inserts, whose weight can be lethal if it should really "collapse" on you. Maybe that's why Collapse 7 define their compositions as Apocalyptic Death. Collapse / are featuring in their line up Mike Gröger (Hollenthon) and Mario Klausner (ex Belphegor and ex Pungent Stench) and this debut album from them is conceived with much care and, as far as i know, or better said , as far i can presume reading their discography, it is not based on previous tracks of demo's MC and CD. Therefore In deep Silence should represent a full new creative debut: not an usual thing nowadays. And such a very positive one!! The instrumental Intro has indeed apocalyptic menacing tones, without being excessive. The impending obscurity is its propelling force. and the best meaningful way to open this album. And we start with fast rhythmic aggressiveness with Infernal Apocalypse, riding a fast galloping with a succession of walls of cadenced riffs supported by a blasting drumming that makes a great effect without being disturbing. The Death and Black attitude is smoothed by that kind of doom-y veil that makes everything less thorny and more bone-breaker. In deep Silence starts as direct succession of the gloomy outro of the previous track and is so sorrowful and pulsing with a total hook Melodic Death/Doom/Black fascination, harmonic evil guitars of devotion melt with a pushing/rolling rhythmic. It is an harmonic explosion that is followed by the more Empty as we are on the same level: the track number 4 shows dark melodious guitars that are detailed with technique and feeling, implacable drums and an enthralling tempo changing of sorrow and a final cascade of brutal melodic compression. After a spoken introductive sermon of apocalyptic and biblical flavor which is the track A prophet's Speech, it starts Blessed with Pain , a bit dissonant and heavy where blasting drums contrast with the slowness and gravity of the atmosphere. And indeed a doomy-blasting evil construction awaits us with riffs that truly gives impression of vacillating vibes, oscillations and, above all, rejection. Into Obscurity is a lake of deep lows impressive fascinating growls, thundering soundscape, implacable riffs, with melodic intensity of desperation and enthralling final of smoothing and unexpected blasting re-escalation. Tombs of Depravity. It maintains the impressive fight with roaring angriness. We could identify it as a kind of slight doom-y Black with much aggressiveness, deep low rasping vocals, Black sacral evocation, restless drumming, walls of hooking riffages , percussive implacable double bass intensity, but always with that certain veil of impending fear. A suicidal Sickness though implacable - develops an enchaining melody again with propulsive double bass drums. Tempo changes, synchronized short sub-rhyhtm's and a catchy outro. Within the Light is short, decadent, instrumental : a slave of an amazing sorrowful melody becoming a spiral of a good loop at the end. This album gives us a sense of mighty pressure coming from a rising (or falling) infernal abyss, typical of that part made of Doom and Black ingredients, but it is a real joy for all who like Classic Death/ Melodic Death à la Kataklysm, controlled brutality, and strokes of melodies. Impending and menacing feelings of obscure gravity meet an agreeable technique , so that technique is no longer a mere sterile exercise. The full coherence of the album guests anyway diversity in the various tracks, without even a shadow of boredom. This album is worth every collapsing cent, and the band , obviously, is worth much more: our sincere attention!